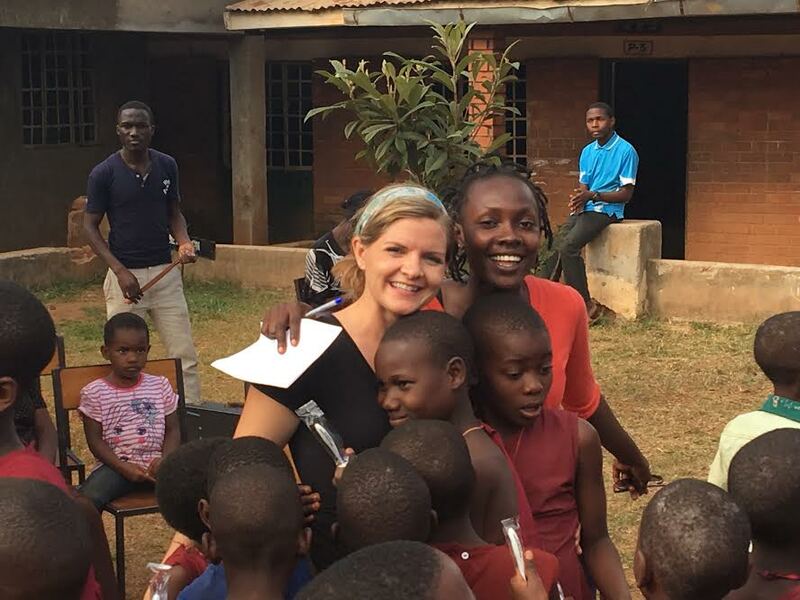 This past August, Allison, Sheree, and Brittany had the opportunity to conduct Vacation Music School at St. Mary Kevin Orphanage and Primary School in Kajjansi, Uganda, a suburb of the capital city Kampala. Dr. Stacy Peterson (the patriarch of Uptown Violins) and Sheree’s husband Ben Lutz accompanied them on the trip. Upon their return, I spent an entire day living vicariously through them all, trying to soak up the experience as best I could, listening to their amazing stories. Here Sheree Lutz, the initiator of the trip, shares her experience. AR: How many children/what ages were you working with? SL: We worked with quite a few children! The first few days we had a music workshop of about 30 kids who were approximately ages 5-8. Then we had our class for about 25 older students who were 9-12 or so. But we spent time with kids even outside of music classes, so it probably accounts for more! AR: What did a typical day look like for you while there? SL: We would arrive at the school in the morning, Allison, Brittany, and myself gave private violin lessons to about 15 violin students. Some just started the violin this year, while others have participated in the program for about three years. They worked on songs such as Twinkle Twinkle Little Star, I Would Like A Fiddle including the “pizzicato” part, and Jesus Loves me. We would then eat lunch at the school prepared by Matron Josephine (who introduced us to some local cuisine!) followed by our music camp in the afternoon. AR: What kinds of techniques did you work on during private lessons? SL: We worked on learning proper positions first and foremost, incorporating aids including proper shoulder rests and the new bow-buddies that help with the bow hold. We also worked on scales, pizzicato, and melody vs. harmony. Their favorite though, was simply learning new songs and having additional music available! AR: What were some of the students’ favorite activities during the afternoon music camps? SL: They loved getting to learn rhythms, which we incorporated into a song from Tarzan. Some children used rattles to play an eighth note rhythm, others used “boom whacker” sticks with quarter notes, and they really enjoyed the partner clapping section. They were also very excited to make the music crafts, especially the bridges donated by Simon McHugh violin shop. They got to paint them, add stickers, ribbons, and more. The older students like competition, so playing Musical Jeopardy, led by Brittany, became very lively. They chose questions from sections we had covered throughout the week, including Music History, Rhythms, Note Names, Playing Your Instrument, and Dynamics. AR: What kinds of concerts did you/the students perform? SL: We thought it important to play a bit for the students to show them what is possible with practice and dedication: we played a wide variety of songs including the Bach Double, an arrangement written by Brittany of Be Thou My Vision/Angel by Jewel, and Fantomen so they could hear a bit of fiddling. The violin students performed Jesus Loves Me, I Would Like a Fiddle, an A-Major scale, as well as a very fun game of “follow the leader” while playing the rhythm “Grasshopper, Grashopper.” They even ended up sitting on the ground while playing! AR: What did you learn from the students/teachers there? SL: The kids are extremely open to learning new things. They cannot get enough information fast enough. What they do with that newfound knowledge is also amazing. They are very creative! They can build toys out of discarded plastic; they play games with found objects such as rocks, and dance unlike anything I’ve ever seen. We learned a lot from hearing their choir perform using call and response, listening to the marching band concert, and the highlight, watching the traditional African dance troupe! AR: Outside of music, what did you enjoy most? SL: We loved getting to know the students, teachers, and staff. Even though they face adversity, they persevere and constantly look out for one another. The teachers helped us so much and there is no way we could have held class without them! The staff, including the school’s director Joan Faith and social worker Melissa Mosher, are amazing women who give of themselves constantly to ensure safety, health, education, and love for the students. AR: What surprised you most about your experience? SL: For me, the most surprising thing was the sense of family between the students. When 150 kids live at the school, it is impossible for the few adults to take on all of the chores. Daily activities that seem daunting to a five-year-old, including washing laundry by hand, learning English, and getting water, can be very difficult. The older students take the younger ones under their wings and help them learn. AR: What are your plans to help maintain a relationship with the students there? SL: We hope to be able to continue the pen-pal relationship we started with our US violin students. They have already been able to send and receive a letter. It was most encouraging for the students to hear from others who live half way across the world, but have the same interests and dedication as themselves. We also hope to maintain relationships through emails, sponsorships, and hopefully a return visit at some point (the configuration of people going may look different!). AR: What are ways in which we can continue to help the students at SMK? SL: The students are dependent upon donations to keep the strings program going. They use the raised funds to pay for the teacher’s salary to come once a week and give instruction. 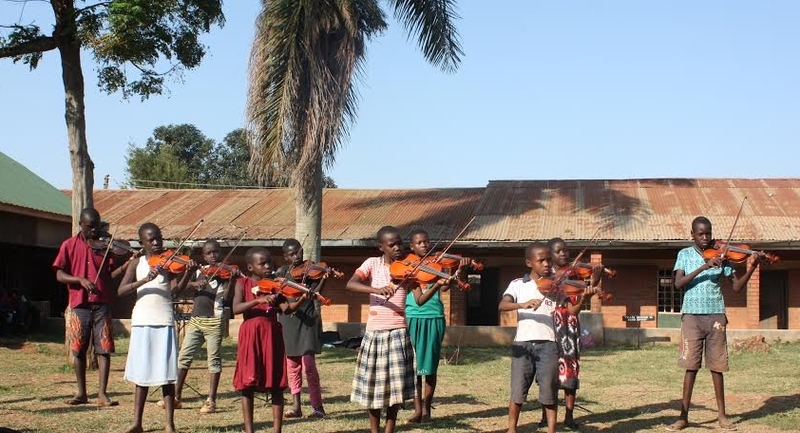 We were so happy to be able to donate 5 violins to the program and leave them there. However, they still have to pay to rent the additional instruments. They always will need new strings, music stands, and rosin. If interested in donating go to either the Change The Truth website (http://changethetruth.org/) or the Strings for Uganda site (http://stringsforuganda.com/ ). Of course, please feel free to contact us at http://www.uptownviolins.com/contact/ if you would like additional information and we can help point you in the right direction! SPECIAL EDITION TO COME SOON!! : Dr. Stacy Peterson's and Mr. Ben Lutz's missions work at the Mengo Hospital and Saint Mary Kevin Orphanage in Uganda!